Amazing Fuchsia Lady Boothby is a hardy fuchsia climbing up to 1.5m in a season. Its vigorous stems will be smothered in exquisite displays of red and blue flowers year after year. Ideal for growing up fences, walls and trellises, or as a feature in a pot with an obelisk or support. Totally hardy, in milder winters it will keepits leaves, and in colder ones will shoot again next season. Supplied as pack of 6 Lady Boothby jumbo plug plants. Fuchsia 'Lady Boothby' is a sensational new kind of Fuchsia, one that is both hardy to frosts, and appears to Climb. 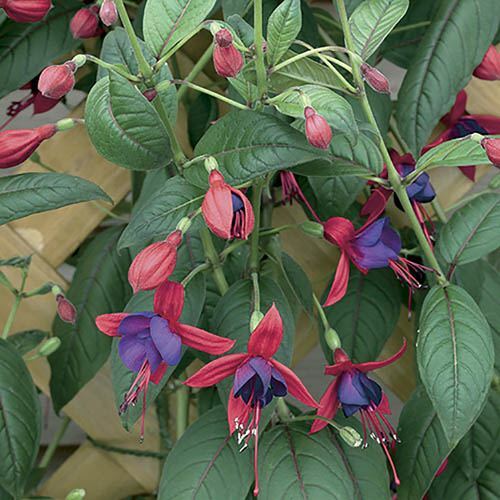 Reaching up to 1.5M in a season, its vigorous stems are covered in red and blue typical fuchsia flowers, making it ideal to grow up fences, walls and trellises. They have strong stems and are very upright growers, but may need some support in windy areas. Flowering from June through till first frosts of late Autumn, in milder Winters it will keep its leaves on, and in colder ones lose its leaves and shoot again from the base the next season. A stunning new type of Fuchsia, and so easy to grow. Lady Boothby lets you grow hardy fuchsias in ways you had never considered. Think of a hedge, or the back of a border, or screening off something. Supplied as a pack of 6 Jumbo plugs (2.5 - 3.5cm diameter), ideal for potting on into 9-10cm pots for a few weeks before planting out, or plant out direct into soil from May onwards - beware slugs! Plants need to be tied in and can be pinched back to keep in check. Plant the base of the stem 5cm below the soil surface and provide a deep winter mulch and shelter from the wind. Grow in fertile, moist but well-drained soil, with shelter from the wind. In containers, use a John Innes No 3 based compost. Water fuchsia plants sufficiently to keep the compost moist but not waterlogged and do not leave plants standing in water. Fuchsias prefer shade for the hottest part of the day.